Mahesh Rangarajan Professor of History & Environmental studies, Ashoka University The General Election is under way, but nobody knows what the results will be. The scale of the process is dwarfed by its inescapable outcome. When the results are declared, the losers will concede and the victorious party will lead the next government. Inured to all this, we rarely marvel at its significance. In his autobiographical novel, The Insider, Narasimha Rao, a former PM, points to a paradox of our democracy. The idea of democracy was predicated on the equality of the rich and poor, of men and women of the so-called ‘high born’ and those once branded as lower social ranks. At the same time, this was a land with centuries, indeed, millennia of hierarchy. In many regions, the monarch was believed to be blessed by divine power. Democracy gave rise to a new kind of leader. This one would not wage war, but would seek support with visions of the future. Rao himself was witness to the fall of the princely state of the Nizam of Hyderabad and the crafting of democratic rule. The fragility of power in a democracy deserves appreciation. Eight of the 16 general elections have led to a change of government. All the instances of defeat have come in and after 1977. In March 1977, the Congress’ tally fell from 352 to 155 seats. ‘We accept the verdict of the people,’ Indira Gandhi said in a statement. This was not a victory of a party, but a celebration of freedom. The denial of civil liberties and democratic rights from June to March was a central issue. In the past 32 years, only three PMs who led their party into campaigns brought it back to power. One was Rajiv Gandhi, but he was in office briefly. Victory came in the wake of Indira Gandhi’s assassination. Vajpayee won in 1999, but was in power only for 13 months. His was the first non-Congress government to serve a full term in office. These were milestones for democracy. Stability was assured by a large party at the core that accommodated the interests of smaller allies and partners in office. His successor took a leaf out of his book and went further. Manmohan Singh was the first PM to complete a full term as head of a coalition and secure re-election. He was the first Prime Minister since Nehru to be re-elected after a full five-year term. Indira does not share the distinction as the Lok Sabha in 1971 was dissolved a year early. 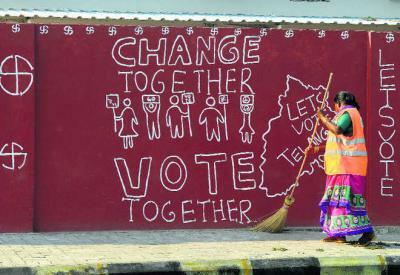 Indians do not just vote. They often throw the rulers out. In 1977, the Congress had just two seats of 226 in the Hindi belt; and in 1980, the Janata Party could not even reach three digits. No PM who governs from South Block can take the office for granted. Yet, with all this, the 2019 elections are truly unusual. This is the first time a cohesive party, other than the Congress, has won a majority and completed five years in office. True, the Janata Party under Morarji Desai formed the first non-Congress government and had a majority, but it lasted less than two years. By contrast, the BJP, which was founded in Bombay in the summer of 1980, took 34 years to win a clear majority in the Lok Sabha. It is a political entity with a clear ideological focus and vision, and this goes back to the days of the Bharatiya Jana Sangh, and even further to 1925 to the formation of the RSS. Whether it unites or divides Indians, and if it marks a new dawn or not, is one of the key issues in this election. Is a plural order better than a cultural nationalist one, and if so, for whom and why? Is diversity a strength or a weakness? The talk of 70 wasted years and a ‘new India’ is a sign of a different set of traditions at the apex of the polity. In this, we also see a different style from the earlier coalition governments of the same party. Gujarat showed the way. Narendra Modi is by no means the first premier to have had experience of serving as Chief Minister. There have been instances of former chief ministers. Morarji Desai, Charan Singh and HD Deve Gowda had been chief ministers of Bombay state, Uttar Pradesh and Karnataka, respectively. Desai had served as Union Finance Minister and presented as many as 10 budgets. Modi was projected as a prime ministerial candidate while serving as CM. His political approach was critical to his appeal five years ago, as the vote share of the NDA rose to 39 per cent. Whether or not this will mark a new kind of leadership at the mass level, as much as in terms of party structures, is too early to tell. But there is little doubt that he is the most influential Indian politician since Indira. There is one distinction she still has. She won two elections and then was defeated, and resoundingly, but was voted back into office. No one in the post-Nehru era has led her party to three victories. The rest of her record also matters. To this day, the negatives often put her considerable achievements (such as the 1971 war or deep awareness of science and ecology) in the shade. Her emasculation of the once vibrant Congress left deep scars on the body politic. So did her playing a deeply sectarian card in North India, with tragic consequences, most so in Punjab. The larger question for India and the ruling party is not who will win in 2019. It is whether the legacy of democracy will emerge stronger by the time the votes are counted. ‘Praja hi raja hai’ as the saying goes. It is the people who are the true rulers. India will endure as its fabric of unity is interwoven in the lives of its millions. But will democratic values emerge stronger? Indians believe in democracy, but will rulers abide by it? 2019 will help show the way.